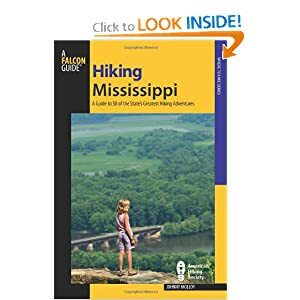 This book details 50 hikes that take place in Mississippi, from the Coldwater Nature Trail near the Tennessee state line to the boardwalks at Davis Bayou on the Gulf Coast and throughout the state between. Specific emphasis was placed on the most scenic destinations and unique places that make Mississippi so special, places like the rocky Bear Creek, the waterfalls of Clark Creek Natural Area and the crest of Little Mountain. Mississippi offers distinct regions in which to trek, the lake country of North Mississippi, the Delta and piney midlands of the Heart of Mississippi and the Coastal Plain of South Mississippi. Hikes covering all three areas, of assorted lengths and difficulties, are included, and add to the variety of experiences. Many hikes take place in Mississippi’s six national forests covering 1.2 million acres spread about the state. These forests not only have hiking trails, but also campgrounds, waterways to float and fish, special scenic areas, botanical areas, hunting and more. Mississippi state parks and forests also dot the land and are destinations for those who want to hike and explore. Wall Doxey State Park harbors innumerable springs. Lake Lowndes State Park offers recreation of all stripes, including, of course, hiking. Leroy Percy State Park has brooding swamp woods. These are but three examples of a fine state park system of which Mississippians should be proud. And don’t forget the linear national park that extends 310 miles through the Magnolia State – the Natchez Trace Parkway. The Parkway functions as a corridor of protected land on which numerous hiking trails are found, including preserved sections of the historic Trace. No matter what entity manages the land, there is plenty to see in this state, from winding blackwater rivers to waterfalls framed in rich forests, to rock outcrops where overhangs provide trailside shelter to dark swamps where nature’s beasts find retreat. You must reach these places by foot. The rewards increase with every footfall beneath stately pines on a sunny knoll or along a scenic lake. A respite into the “real” Mississippi will revitalize both mind and spirit. To wander through remote forests, to contemplate pioneer lives at an old homesite or to peer into a cypress swamp will put our lives into perspective. That is where this book will come into play. It will help you make every step count, whether you are leading the family on a brief day hike or undertaking a challenging backpack into the back of beyond. With your precious time and the knowledge imparted to you, your outdoor experience will be realized to its fullest. With the joy of completing a book and the sadness of an adventure ended, I finished my research. But I will continue putting my lessons to work, enjoying more of Mississippi in future outdoor adventures. May this book help you get out and make some memories of your own, trekking the treasures of the Magnolia State. Mississippi’s climate experiences offers good hiking conditions most of the year, and four distinct seasons, with high summer being the only time not conducive for hiking. During the long summer highs regularly reach the 90s and a thunderstorm can come most any afternoon. Warm nights stay up in the 70s. Fall brings cooler nights and warm days. October is the driest month. Winter is variable. By the Gulf highs push 60 degrees. Expect lows in the 40s, though subfreezing temperatures are the norm during cold snaps. Up north, winter highs are in the low 50s. No matter where you are in Mississippi there are usually several mild days during each winter month. Precipitation comes in strong continental fronts, with persistent rains followed by sunny, cold days. Snow is uncommon, though not unheard of. The longer days of spring begin the warm-up process, becoming even hot, but temperatures can vary wildly. Spring will move north from the Gulf but is in full control of the entire state by mid-April. Using Jackson as a baseline, the rainiest months are from November through April. It is this same span that highs average below 80, which are more favorable for hiking. However, you can still hike during the warmer months. Try to do your trekking in the mornings, that way you will also avoid most summer thunderstorms. Mississippi’s topography ranges from the Appalachian Foothills in the northeast to the Piney Hills to the enormous and wild Mississippi River bottoms to the Gulf Coast. Thus, the state’s flora and fauna reflects this variety. Mississippi is a bit over 50% is forested. The creeks and major river bottoms are covered in cypress, tupelo and wetland oaks, as well as beech and the straight trunked tulip tree. Shortleaf pine is king in the upland areas, along with its partners, the drier oaks – such as post oak and red oak, and mockernut hickory. Longleaf and slash pines are more common in central and south Mississippi, with loblolly pines being in the moister areas of the south. Planted pine plantations extend throughout the state. Sweetgums seem to be everywhere. Wildlife is abundant throughout the state. Raccoons, rabbits and squirrels range wide. Deer are found in high numbers and are the mammal you are most likely to see. Kudzu — of which Mississippi has plenty — is an important browse food for deer, especially where they are in high numbers. Fawns use the dense vine cover of kudzu to stay hidden. Deer population estimates vary, with some ranging as high as a staggering 1.75 million of these four-legged creatures. The black bear is making a comeback, but their numbers are limited to a few hundred. The state features two species, the American black bear and the endangered Louisiana black bear. They reach their greatest numbers in the Delta near Rolling Fork and all along the Mississippi River corridor from Louisiana to a couple of counties south of Memphis. Some are also found in the national forests in south Mississippi. A few are sighted every year in the northeast as well. Black bears are federally protected in Mississippi as a threatened subspecies, the subspecies being the Louisiana black bear. The American alligator also ranges throughout south and central Mississippi, but sometimes can be found as far north as Lafayette County. Population estimates range around 35,000 spread out over 400,000 acres of alligator habitat. One quarter of all the state’s alligators live in Jackson County, home of Pascagoula. Another coastal county with a high population is Hancock. The coastal component of Mississippi is comprised of marshes, beaches, dunes and barrier islands. The saltwater influenced environments are worlds unto themselves, with a variety of saltwater fish and mammals, including sharks and sea turtles. Pelicans, herons, egrets, skimmers and other shorebirds occupy the Gulf Coast.